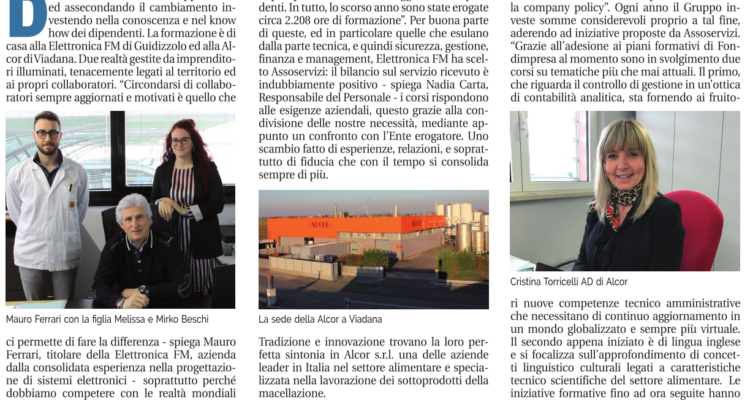 “Being surrounded by up-to-date and motivated cooperators is what allows us to make the difference above all – explains Mauro Ferrari, owner of Elettronica FM, a company with a consolidated experience in the design of electronic systems – because we have to compete with the world realities burdened by a burden of indirect costs, such as energy, which affect us “. Ferrari in 2015 decided to invest, creating the first industrial building in class A ++, self-powered and with a cleanroom (aseptic) of 1000 square meters used to produce electronic material which is the company’s core business. “We bought new machines, but it would have been totally useless if we did not update the employees in the same way, and last year about 2,208 hours of training were provided". For most of these, and in particular those that go beyond the technical side, and therefore safety, finance management and management, Elettronica FM has chosen Assoservizi: the result on the service received is undoubtedly positive – explains Nadia Carta, Head of Personnel – the courses respond to business needs, this thanks to the sharing of our needs, through a comparison with the provider. An exchange made of experiences, relationships, and above all of trust, which with time consolidates itself more and more.